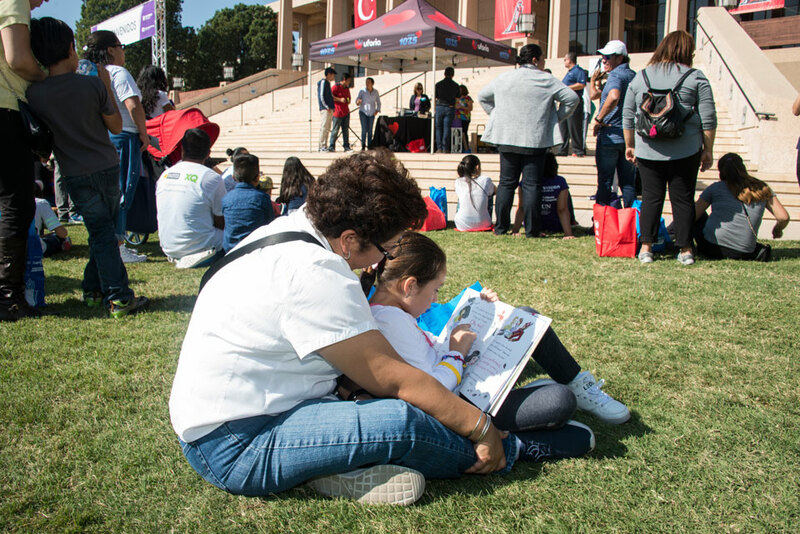 A mother and her daughter sit on the lawn in front of the Oviatt Library to read a book at last year's Feria de Education. Photo by David J. Hawkins. Univision Los Angeles, the California State University Chancellor’s Office and California State University, Northridge are teaming up Saturday, Sept. 23, to help thousands of young Latinos and their families discover paths to success at Feria de Educación, a daylong celebration focused on proving educational resources and information on building blocks for achieving academic and professional success. The annual free event, part of Univision “Regresa a Classes” (Back-to-School) campaign. Through its award-winning corporate social responsibility platform, Univision Contigo, the campaign is focused on promoting Science, Technology, Engineering, Arts and Mathematics (STEAM) building blocks, education, opportunities and careers for Latinos. 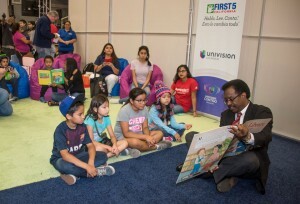 CSUN Vice President for Student Affairs and Dean of Students William Watkins reads to a group of young people at Feria de Education 2016. Photo by Lee Choo. The Feria has become one of the largest education fairs in the nation and is free for parents, students and educators. The event is scheduled to take place from 9:30 a.m. to 3 p.m. in areas and buildings around CSUN’s Delmar T. Oviatt Library, located in the heart of the campus at 18111 Nordhoff St. in Northridge. This is the second year CSUN has hosted the event. Since 2009, Univision Los Angeles has partnered with the CSU to host Feria de Educación on one of its campuses. This one-day education fair is filled with Spanish- and English-language workshops and other activities designed to give parents the tools to help their children achieve their educational and career goals, providing resources and valuable information on the full spectrum of education. Workshops will cover such topics as how to create a learning environment at home; an exploration of California’s three public higher education systems and its private colleges; overviews of the college application process; services for undocumented students; the financial aid process; immigration; support for students with learning disabilities; the LGBTQ community and the support offered by the Educational Opportunity Programs to students, as well as conversations with currently enrolled students about life on campus. The Feria will include a “reading garden,” and a variety of age-appropriate books and learning materials will be distributed to encourage children and their parents to read together. There will be exhibits explaining the “pathway” to higher education with additional resources and information, beginning with pre-K and continuing through post-graduate services. There also will be opportunities for participants to learn about health and wellness. Univision personalities Claudia Botero and Eder “Gorritas” Diaz will serve as opening ceremony emcees. Joining the event’s activities, including the reading garden and Univision booth are: Leon Krauze, Norma Roque, Stephanie Bradford, Julio Cesar Ortiz and Guillermo Quiroz from the Univision family. The Feria de Educación supports the CSU’s Graduation Initiative 2025 that is focused on increasing the completion rates of first-time freshmen, transfer, low-income and underserved students. The Graduation Initiative 2025 will add 100,000 more college graduates to California’s workforce over the next 10 years, bringing the total number of expected CSU graduates between 2015 and 2025 to more than 1 million. Originally launched in February 2010, Univision Contigo’s education platform remains the nation’s longest-running multimedia education campaign on the air. Today, with the help of leading organizations such as the Bill & Melinda Gates Foundation, Too Small to Fail, the Bezos Family Foundation, XQ Institute and Common Sense Media, among others, the initiative continues to empower Latino families to invest in their children’s education in order to ensure their success in college and beyond. For more information about the Feria de Educación at CSUN, visit www.csun.edu/feria. To learn more about Feria events across California, visit www.calstate.edu/feriadeeducacion.